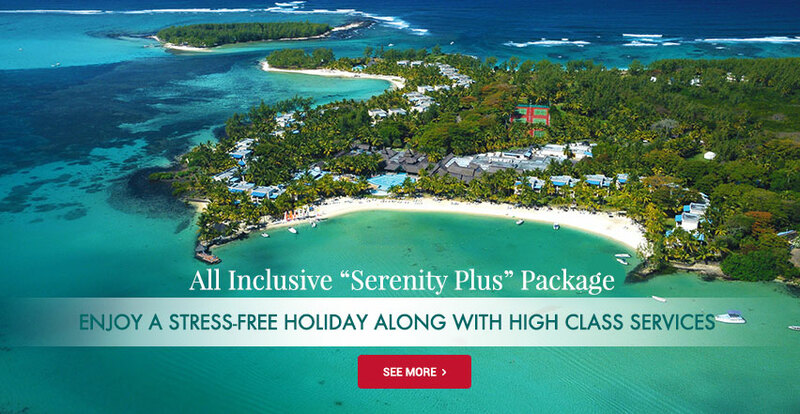 Enjoy a totally carefree holiday and let yourself be pampered with an All-Inclusive package in one of the amazing hotels on Mauritius Paradise Island. Located in the heart of the Indian Ocean, Mauritius Island is considered as a precious stone offering lush natural landscapes, ideal tropical climate, white sandy beaches along with magnificent turquoise waters. The Island features a wide array of All-Inclusive hotels offering variety unlimited food, variety of beverages and alcoholic drinks (local spirits), various land & water activities, and as well as day & night entertainment program. Having an All Inclusive package, you can rest assured that everything is covered in the price of your holiday. So, leave your wallet in your room and make the most of these blissful moments with your loved ones! For the families, be sure to benefit from an all-inclusive package consisting of plenty of entertainment for both kids and adults. Relish on great meals plans featuring a wide choice of dishes to please every palate and drink as much as you want with unlimited drinks available throughout the day and night. If you are heading to an all-inclusive resort without the kids, an adults-only option can offer a more refined setting. And if you just want to relax on the beach all week, you may want to choose a less expensive property that does not offer all the bells and whistles of luxury resorts. So whether you want to try the complimentary land and water activities, relax during a rejuvenating treatment at the sauna or hammam or just lying near the pool to enjoy a great sun bathing, you will unwind serenely in knowledge that it’s all included. Located on the glorious East Coast of Mauritius, Veranda Palmar Beach Hotel evokes style in an informal and relaxed ambience. Indulge yourself in one of the most beautiful natural sites of the region with stunning clear blue waters, white sandy beaches and soothing sea breeze. This beach hotel offers a large range of delights that the ocean and the beach guarantee. Discover a blissful haven set amid flowering bougainvillea with thatched roofs and whitewashed walls - the ideal choice for an intimate holiday with family or friends. The hotel features 76 pleasant rooms with furnished balcony or terrace where you can relax and enjoy great natural views over the garden, pool or sea. Ideal for families, friends and couples, the Veranda Palmar All-inclusive package offers you a rejuvenating breakaway with attractive spa discount. The renowned Seven Colours Wellness Spa and Sauna is considered as a serene oasis and offers a place of tranquility and beauty to his valuable guest, ideal for revitalizing your mind and body. Make the most of the wide array of complimentary facilities, from land to water activities; you will always have something to do. You can also choose to stroll along the lush tropical garden planted with coconut and royal palms rustled by the cool sea breezes. In addition, The Veranda Palmar Beach Hotel was recognized at the Traveler’s Choice Awards of TripAdvisor and was ranked in “Top 10 Best bargain - Mauritius” category. So if you want to spend some perfect vacations choose the Veranda Palmar Beach Hotel, a new standards in style and charm at a very affordable price. 77 rooms that take nature as its design inspiration. Surrender your sense to the beauty of Tropical Attitude Hotel, an all-inclusive Adults Only hotel found in the middle of a tropical garden dotted with coconut trees and overlooking the lagoon. The resort blends seamlessly into the natural environment which offers guests a host of exciting nature experiences. When you choose Tropical Attitude Hotel for your holiday getaway, you can expect excellence from the start to the finish. 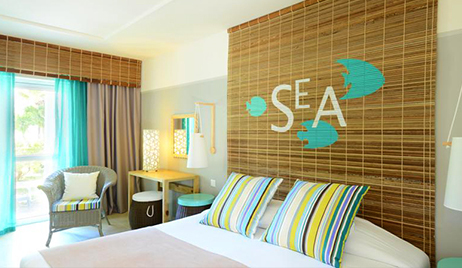 Located in Trou d’Eau Douce, the 3 star sup hotel is nestled in a picturesque fishermen village offering perfect setting to de-stress. Featuring an exclusive Adult Only concept, spend a wonderful relaxing day together with your loved ones or friends. Savor local and international dishes featured by the hotel’s renowned restaurant - Le Cocotier restaurant and the Taba-J which overlook Trou d’Eau Douce’s magnificent lagoon. The main restaurant is offers a refined modern style and is dressed with beautiful ceruse panels, with shoals of fish swimming along the white walls. The new lounge-bar will be the ideal place to sip a cocktail under the coconut trees, bare feet in the sand and facing the famous Ile aux Cerfs. For some extra moments to rejuvenate your mind and soul, you can choose to be pampered at the Spa Attitude and benefit from good discount on the treatments. 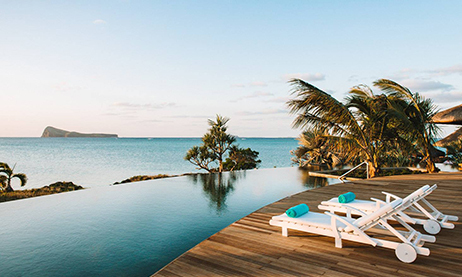 Representing a true illustration of the Mauritian art de vivre, Coin de Mire Attitude is a charming all-inclusive 3 star hotel located at Cap Malheureux. Contemplate the breathtaking view of the majestic Coin de Mire Island and the other northern islets. Lying in one of the most beautiful spots of the island, the hotel offers a true oasis of peace and tranquility surrounded by stunning natural scenery. With its contemporary style and some tropical touch of the island to complete the interior decorations, the rooms will be the ideal place to unwind after a great day. All the 102 spacious rooms are surrounded by the tropical garden and are well-equipped with telephone access, television, bathroom with shower, electronic safe, air-condition, and the list goes on. Ideal for those searching for an intimate and all-inclusive retreat at an affordable price, enjoy all the facilities offered by the hotel, including two swimming pools, a poolside bar and kids’ club. Savor refined culinary dishes at La Paillote Restaurant which is specialized in seafood and especially in its famous lobster menu. (On request and with supplement). For absolute indulgence during your holiday, The Spa Attitude will provide you with a list of four signature treatments to harmonize perfectly your body and soul: Earth Attitude, Sea Attitude, Sun Attitude and Flora Attitude. 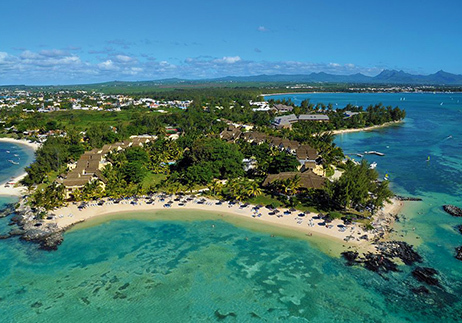 Located on the unspoiled East coast of Mauritius, discover the Emeraude Beach Attitude Hotel boasting the famous Belle Mare beach. You will discover an authentic place which combine perfectly chilled-out ambiance with tropical island charm. Set amidst a beautiful lush garden, the 3-Star Emeraude Beach Attitude is an excellent choice for a unique and soothing breakaway. The hotel features an innovative “All Inclusive” and “Émeraude +” package, where you are sure to enjoy amazing seaside holiday with your family and friends. 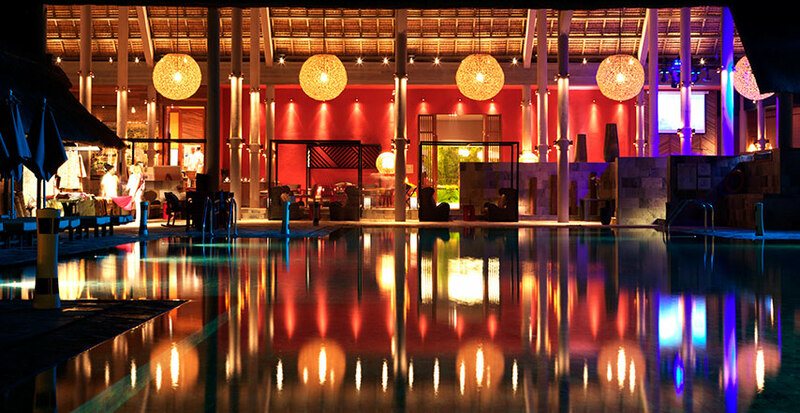 It offers elegant and comfortable twinned rooms surrounding a pleasant pool area, a restaurant and a bar. All the accommodations feature a furnished private terrace or balcony where you can enjoy splendid views and offer great room amenities such as a TV, a minibar, bathroom and shower. Spend a fun and joyful stay at the hotel by trying the wide array of complimentary activities available and free of charge. You can also opt to relax beside the outdoor pool, furnished with sun loungers and umbrellas, ideal to enjoy an energizing sun bath. 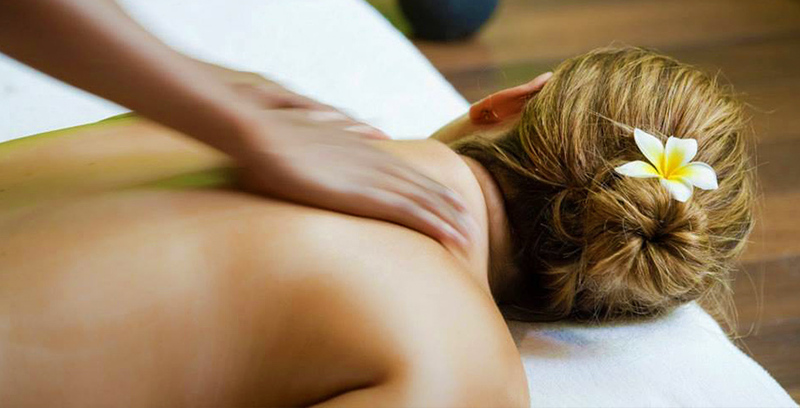 Visit the Spa Attitude and let you pampered with a rejuvenating massage based on natural elements from plants and sea. Savor fresh buffet breakfast and themed buffet dinner served daily at the Alizés Restaurant. And above all, do not miss the refreshing cocktails served at the Tides Bar next to the pool. 61 rooms which are decorated with refined taste and creativity. 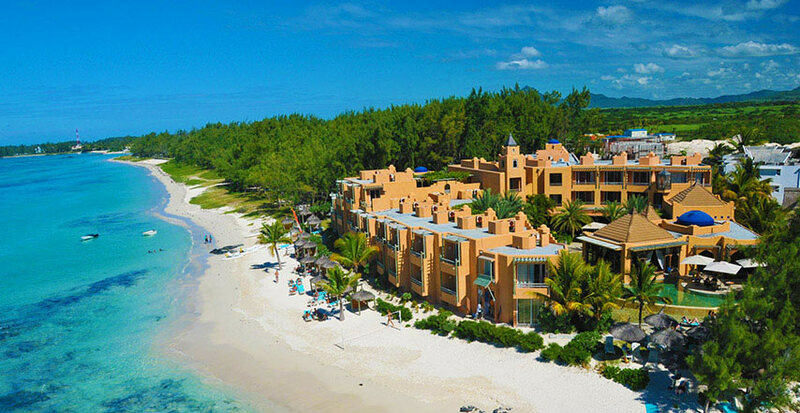 The Récif Attitude - Adults Only offers a revitalizing escape with glorious ocean views of the beach of Pointe aux Piments focusing on pampering the adults in the best way possible. This hotel is all about enjoying a romantic and intimate holiday with your loved ones or with friends. As soon as you step into the entrance featuring an open air patio, you will be seduced by its contemporary design, cozy setting and lush vegetation. Fashioned in white wall and wood touch, Récif Attitude offers a mix of comfort, vibrant Mauritian soul and boutique hotel spirit. The 70 rooms consist of cubical architecture, modern furniture and refined design. Récif Attitude is an invitation for those looking for pure relaxation moments; spend hour’s sun bathing, sipping an exotic cocktail facing the lagoon, bare feet in the sand or why not starting a good book lying in one of the cozy sitting corners scattered here and there. Nestled far from the hustle and bustle of certain beaches, you will appreciate the calmness of this authentic yet unspoiled coast of Mauritius. 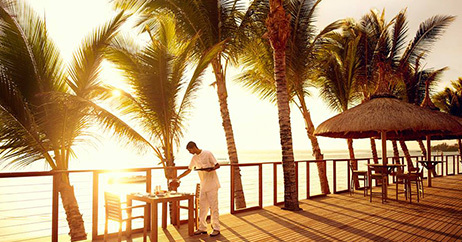 At sunset, Récif Attitude is the ideal spot to watch the sun set slowly entering the Indian Ocean. Food wise, you will relish on a large variety of international or traditional Mauritian dishes in a charming atmosphere, just a few meters from the lagoon. So, come and enjoy this all inclusive offer at an affordable price to recharge in energy and spend good time with friends or as a couple. 70 rooms which have been recently renovated. True to Green commitment, all the rooms are equipped with low consumption bulbs. 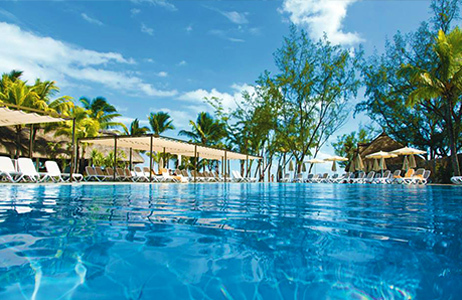 Surrounded by lush tropical gardens and overlooking the stunning blue lagoon of Trou D’eau Douce, Silver Beach Hotel will be your ideal escape for a serene and relaxing holiday featuring an all-inclusive package! Situated in a secluded area of the East Coast of the Island, the hotel offers a comfy cocoon for lovebirds and family. The Silver Beach Hotel comprises of 60 pleasant rooms with terrace or balcony, and are all blessed with either a spectacular view over the lagoon or over the lush tropical gardens. All the rooms offers great amenities such as air conditioning, double (king size) or twin beds, bathroom with shower and toilet, telephone, hair dryer, wall safe and TV. Relish on exquisite European and authentic Mauritian cuisine at the hotel’s restaurant facing the pool and the sea. With tantalizing “a la carte” and buffet menus, enjoy a delious culinary journey at Silver Beach Hotel. The restaurant has also an attached bar where you can sip on a variety of refreshing drinks and cocktails. Make the most of the various complimentary activities offered at the hotel during the day or you can just relax by the pool, sipping an exotic cocktail. Guests will also have the privilege to enjoy evening entertainment during their stay with live musical entertainment or the Sega show. Other services including laundry, babysitting. With its beautiful Moorish architecture inspired by the Moroccan culture, the Casuarina Resort and Spa Hotel is nestled amidst a lush tropical garden and guarantees blissful moments with all the comfort and pleasant setting to make your stay a memorable one. Built in the 70’s among the very first hotels of the island, the Casuarina Resort and Spa derives its name from the famous filao tree, true symbol of holidays in Mauritius. Found on the northwest coast, facing the well-known beautiful lagoon and beach of Trou-aux Biches, experience an authentic Mauritian holiday with the Casuarina Resort and Spa Hotel. Enjoy a truly amazing holiday in this four-star All-Inclusive hotel which accommodate 95 superior en-suite rooms. Fashioned with a charming and contemporary interior design, all rooms welcome guests in a warm and cozy atmosphere. Make the most of the terrace or balcony facing the lagoon with its crystal clear water, an ideal refuge to relax. After some renovations, the splendid beach of the hotel is once again accessible to its clients. With a wider beachfront, more coconut palms and filao trees on the edge, the scenery will simply embellish your dream holiday in Mauritius! At Casuarina Resorts & Spa, all is put forward to provide a cozy and charming atmosphere to its clients at a very affordable price. Veranda Paul & Virginie Hotel & Spa is the ideal romantic hideaway for those looking for some “us” moments. Here time stands still and romance hangs in the air like a heady perfume. Offering a real love nest, Veranda Paul & Virginie Hotel & Spa is an Adluts Only hotel which brings couples closer together. Located on the Northern tip of Mauritius, Veranda Paul & Virginie overlooked the quiet and serene beach of Grand Gaube. As you step in the hotel, you will discover a refined and tasteful setting, using the best local materials to bring a real Mauritian touch but as well as some old prints taken from the Bernardin de Saint Pierre mythical love story novel, Paul et Virginie. All is put forward to welcome you in the most romantic of settings. Happily ensconced in love nest sofas or swinging gently in a double hammock, you can relish the deep calm of this environment and the joy of being together. Experience exquisite culinary journey at ‘Le Saint Géran’ beach restaurant for tantalising seafood dishes. The restaurant offers an idyllic setting and is located on the sandy pier surrounded by water, while the Isle de France restaurant is situated between the swimming pool and the sea and offers innovative Mauritian cuisine. In the evening, the bar serves exotic cocktails and has live entertainment. 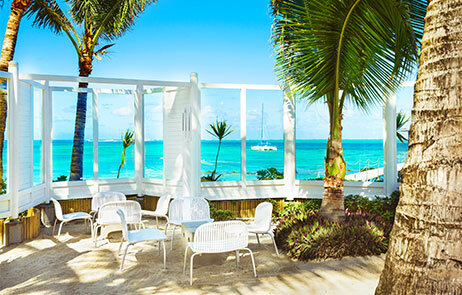 Le Palmiste Resort & Spa is a charming all-inclusive three-star hotel situated in the quaint of the world-famous seaside village of Trou aux Biches. Come for pleasure, romance and relaxation, for spectacular cocktails and excellent cuisine blending Mauritian and International flavors, Le Palmiste Resort & Spa is all about pampering and relaxing atmosphere. Indulge yourself in new standards in luxury, a place of calm and beauty with this vibrant All Inclusive resort. Enjoy luscious dishes at Le Cateau Vert restaurant with its elegant interior design combining the charm of wood, stone and warm colours. Ideally positioned overlooking the central courtyard pool, the restaurant provides a pleasant setting to savor exquisite meals along with impeccable service. The two poolside bars will be the perfect meeting point to sip an exotic cocktail and to enjoy the selection of delightful snacks. Le Palmiste Resort & Spa, recommended on Tripadvisor and HolidayCheck, is a great place for individual travelers, couples and families alike as it offers a beautiful mix of soothing atmosphere amidst a gorgeous tropical garden, cosmopolitan comfort and most of all an excellent value for money. 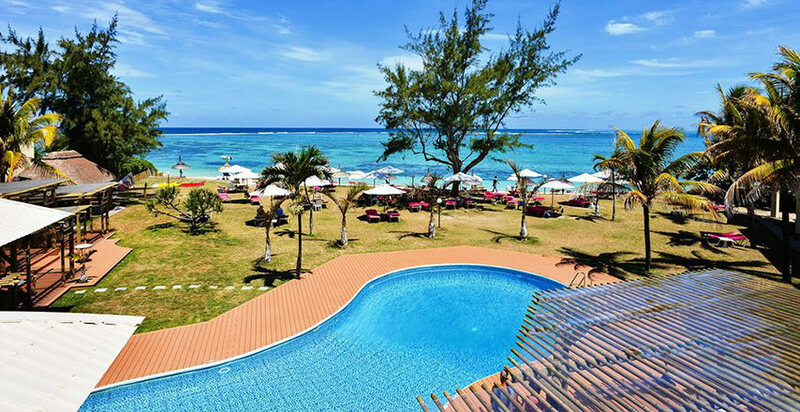 Pristine white sandy beaches along with the crystal clear lagoons, The Merville Beach Hotel will be your perfect getaway to spend an amazing time with family and friends. 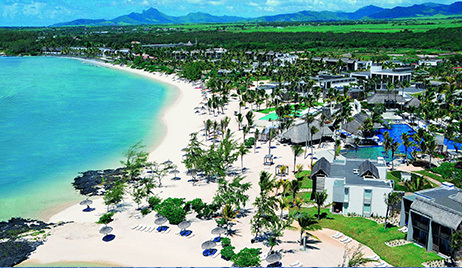 Located on the glorious Northern Coast of Mauritius, this All Inclusive hotel is found nearby the trendy seaside village of Grand Bay, famous for its bustling nightlife, restaurants and shopping facilities. The three-star superior beach hotel is an oasis of tranquility. Walk along the lush tropical garden, dotted with coconut trees and enjoy peaceful atmosphere. Relish on the delious dishes of local and international menus at Le Badamier Restaurant. Sip a refreshing exotic cocktail lounging on your beach bed, or surrender to pure relaxation at the well-known LUX* Me Spa offering a wide choice of treatments at attractive prices. The hotel features cozy accommodations, ideal places to relax and unwind. 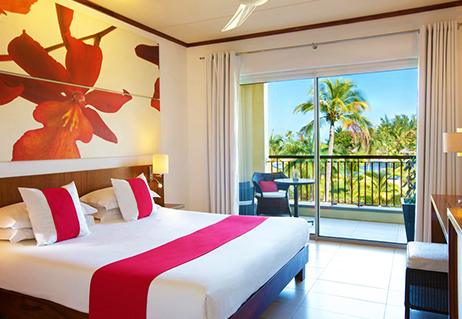 Enjoy the vibrant colours and beautiful views over the lagoon or tropical gardens from your rooms. Featuring a simple designs in clean white tones, with splashes of tropical yellow, red and orange, feel the harmony along with the signature scent of flowers and vanilla drifting through the air. 169 rooms spread between the main building and bungalows scattered in the gardens. 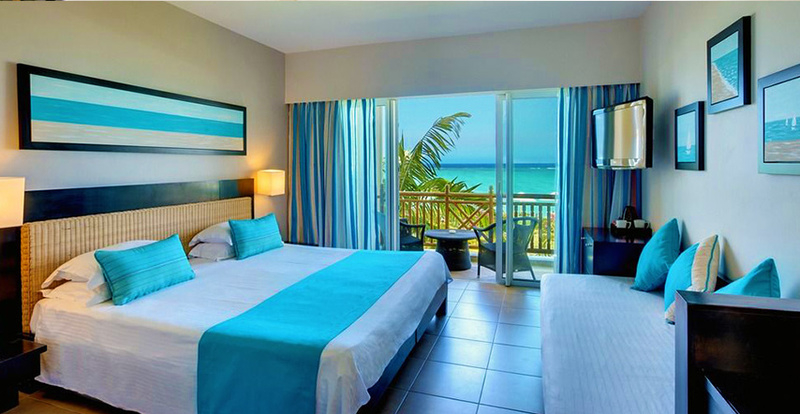 Welcome to Tamassa - an all-inclusive hotel by LUX* Mauritius located at Bel Ombre in the South-West on Mauritius. This vibrant resort is nestled amidst a tropical gardens along with white sandy beaches, cobalt ocean and beautiful coconut trees. Surrounded by majestic mountains and luxuriant sugarcane fields, discover a cheerful and lively atmosphere combines with modern refined decors which will bring to the young the perfect place for fun and happy moments. Tamassa possesed a unique charm to itself. Fashioned with warm coloured roofs and walls made from local volcanic stones; lush natural vegetations; room suites overlooking the blue lagoon and aligned in arcs round the spacious pools, all these will truly capture your senses especially at night with the lights adding a romantic touch. Discover the LUX*Me spa where it’s all about you. Indulge yourself in pure relaxation to rejuvenate your mind and soul through personalized attention with the indulgent ’Me Time’ Spa Menu. Allow the skillful spa therapists to tailor-make an experience exclusively for you according to your wishes and preferences. You will enjoy blissful treatments which are offered at the spa. From luxurious facials, massages and scrubs to energizing yoga classes, the LUX* Me spa and fitness programs have been designed to keep your body beautifully beach ready and in harmony with your idyllic island surrounds. 214 rooms feature a contemporary décor combining clean lines and bold colours. Located near the historical village of Mahébourg, Preskil Beach Resort is a oasis of peace with a friendly and comfy atmosphere. The hotel is ideally set in a lush tropical garden on the South-East Coast of the island, facing a 750-meter long white sandy beach and the pristine blue water of Blue Bay. The decors feature refined luxury design along with typical Creole architectural style, giving the hotel a unique status of holiday, leisure and serenity. Make the most of the All Inclusive offer and enjoy all the services and facilities of a 4 Stars hotel at a very attractive rates. This hotel is the perfect destination for a memorable vacation with family and friends. Offering an exclusive culinary journey, you will definitely enjoy dining at the resort’s restaurants with attractive and pleasant surroundings. On the beachfront, you will discover the natural beauty that the hotel has to offer with beautiful white sandy beach along with a charming Mediterranean-style deck. Enjoy a mouthwatering lunch prepared by the skilled chefs of the Preskil Beach Resort in the most relaxed atmosphere and feel the gentle sea-breeze on your skin. It will definitely be your perfect escape to spend a memorable holiday. 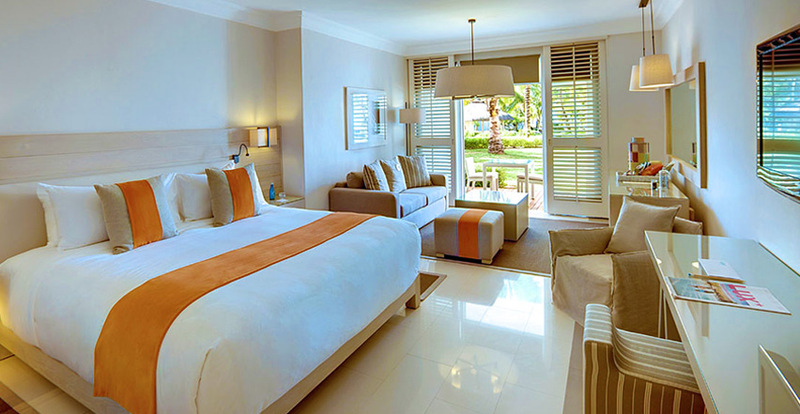 200 comfortable and spacious rooms with a tropical decor. Japanese Baths, Sauna & Steam bath. 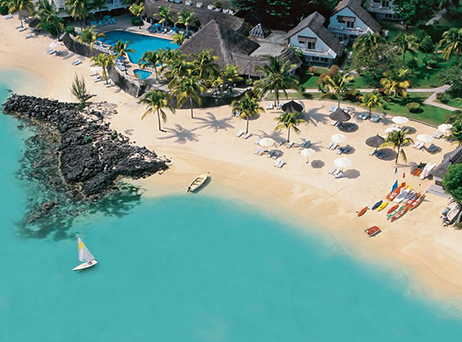 Pearle Beach Resort & Spa is situated on one of the most beautiful beaches of Mauritius in Wolmar. With a modern setting and spectacular sea views, this hotel is the ideal place to unwind serenely with your family & friends. Open the door of an elegant resort filled with sunlight, harmonious warm colours and sublime views of the azure-coloured beachfronts. It is a place of quiet seclusion to rest, do business or relax after a long day of sightseeing, shopping and sports. Offering a real value for money All Inclusive package, the resort ensure a peace of mind holiday where all is putting forward to make your stay memorable. Immerse yourself in a relaxing and soothing atmosphere and enjoy the excellent facilities and services of this four-star hotel. The staff anticipates what you need, then provide it, leaving you free to savour each moment of your time. Time is purely subjective within Pearle Beach Resort & Spa environment as if it was made for unique moments, the kind that leaves indelible traces in one’s heart. Whether you are enjoying a meal in one of the hotel’s restaurants, a treatment at the lavish Serenity spa or simply relaxing on the beach or at the hotel’s swimming pool, the attentive team at Pearle Beach Resort & Spa is committed to your well-being. 74 rooms designed with harmonious designs to create a peaceful environment. When you choose Le Mauricia for your holiday, you can expect perfection from start to finish; it is undeniably a refined hotel in Mauritius. 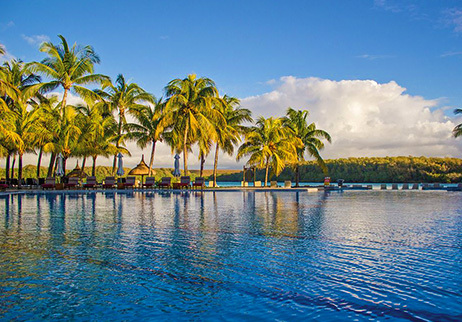 Ideally situated on the North Coast of Mauritius with perfect sunlit spot, Le Mauricia is an elegant four-star Beachcomber hotel which is considered as a tropical haven of tranquility and serenity with an uncompromising dedication to excellence and personalized services. Sophisticated and comfortable with an intimate approach, the hotel offers the best of both worlds: the relaxation, the facilities & services and the perfect resort setting for luxurious holiday and at the front door, the vibrant and bustling village of Grand Bay with its shopping facilities, restaurants, markets and lively night-life. So, whether you choose to chill and relax at the hotel or opt for a walk in the renowned village of Grand Bay, you are sure to spend an amazing time. Featuring a traditional Mediterranean style, the hotel faced the glorious bay of the North Coast with its white sandy beach and shady coconut trees. 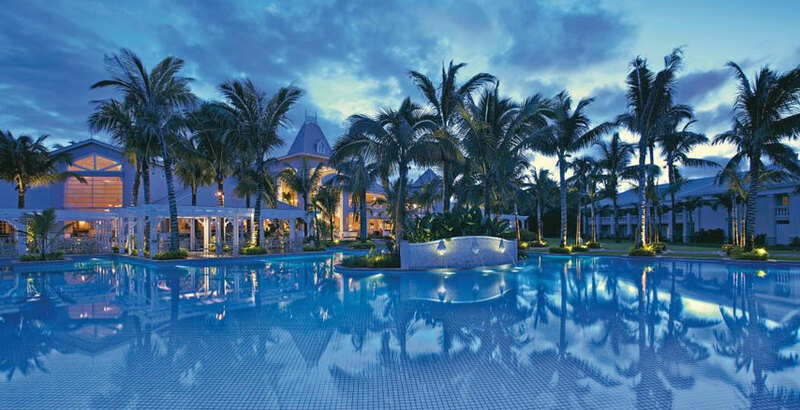 Le Mauricia Hotel and its devoted staff members incarnate the popular Mauritian hospitality with perfection. 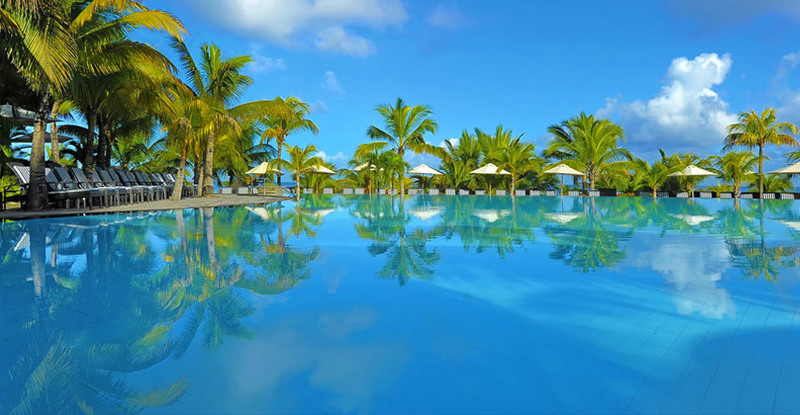 The hotel is also well-known as one of the most popular family resorts in Mauritius, offering an exclusive package called the “Beachcomber All-Inclusive Package”, families can relax in total peace of mind during their stay, knowing everything is catered for. 237 modern and comfortable rooms and suites. 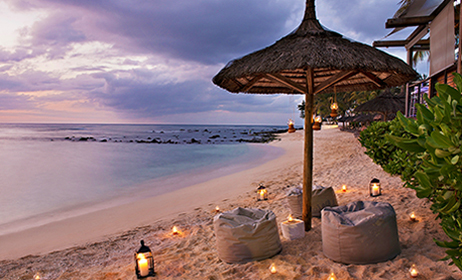 Le Canonnier, a Beachcomber hotel is located on a historic peninsula on the northern coastline of Mauritius. Being a family resorts, discover the authentic and vibrant Mauritian spirits with breathtaking views over the North islets and beautiful turquoise lagoon. The hotel is surrounded by luxuriant natural vegetations patterned with cascading pools and a string of unspoiled creeks. Le Canonnier hotel has succeeded in preserving its natural beauty and unique character of relics of a bygone era. Bearing testimony to the island’s historical past are; ruins of a lighthouse and fortress blending seamlessly into the tropical gardens. Indulge in pure pampering treats and make the most of the exclusive “Beachcomber All-Inclusive Package” for complete peace of mind during your holidays. Just lie on the beach and let you be pampered with the ultimate choice and service. More than your usual ‘All-Inclusive’ offer, the Beachcomber All-Inclusive Package has been designed for you to spend a soothing and tranquil stay with extra facilities and services. Nestled along the beautiful Palmar beach, La Palmeraie is a welcoming four-star boutique hotel with splendid atmosphere and setting. Behind its majestic doors, you will discover a refined and luxurious hotel which combine harmoniously the spirits of North African and Spanish along with alluring “Moorish” architecture, ideal for those looking for an intimate stay. 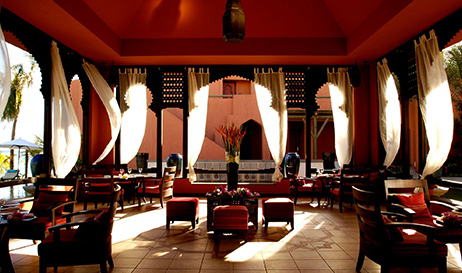 The hotel features 3 restaurants and 1 bar which boast beautifully the aspect of a traditional Moroccan Riad. Each of the restaurant offers different cuisine experiences in order to please every guest. The main restaurant, La Varangue proposed to his valuable guest an exquisite Mauritian cuisine, and the Cotomili restaurant serves tasty Mediterranean, French and Oriental traditional cuisine. You can opt to have a luscious breakfast and other light lunches at the Deck offering great natural views. Staying at La Palmeraie Boutique Hotel will guarantee you top-quality services along with reliability. A unique stay that promise the most warmth greeting and the typic conviviality of the Mauritian peoples. In addition, La Palmeraie Boutique Hotel feature an All Inclusive offer for a truly stress-free holiday, with all your needs catered for well. Relax knowing all your meals, cocktails and entertainment are paid for. The only thing left to do is sit back and enjoy your stay! 60 rooms with romantic ivory canopy, geometrical design and intricately designed furniture combines the unique style of Morocco to create the perfect retreat. Whether you are looking for a family holiday, a couple’s romantic getaway, some exciting water sports, or simply to get away from it all with a spot of pampering and wellness, choose the elegant and cosmopolitan Le Meridien All Inclusive resort hotel. Leave everything behind and enjoy a romantic escape or a serene getaway at Pointe aux Piments! Le Meridien Resort Hotel is ideally set in a luxuriant tropical garden offering a great pool area where you can sip a refreshing cocktails and relax on the various sunbeds facing the sea or the pool available here and there. With its direct access to a private splendid beach, feel the sense of relaxation and tranquility floating in the air! The resort accomodates 265 comfortable rooms with great amenities which are spread over 3 floors. Guests will be delighted to find sophisticated dining options scattered throughout the resort where each of them offered different cuisine and settings. From Italian to Latin America dishes or to more leisurely tropical fare, all the taste will be satisfy with excellent gastronomic cuisine. Beyond simple relaxation granted by the sand and sea, the resort provides a myriad of complimentary activities for both kids and adults. Le Meridien Resort Hotel has something for everyone, so enjoy all the facilities and sevices that the resort has to offer. The Tamarina Golf & Spa Boutique Hotel invites you to share some moments of pure indulgence in an amazing four-star boutique hotel which offers remarkable, relaxed and blissful holidays. You will find a refuge to relax and spend matchless quality time with your loved one or with your family and friends. With a modern African Style architecture, the Tamarina Golf & Spa Boutique Hotel is nestled in a lush tropical garden on the West Coast of Mauritius and offers unique idyllic setting between majestic mountains and sparkling sea water. Here, you will discover a cocoon of peace where you can escape from the burstling of everyday life. All rooms are styled in a fusion of African touch and Mauritian charm with a modern twist creating a comfortable haven; perfect place to recharge and unwind. They are all decorated in warm colors and with natural materials, giving them a welcoming and convivial feel. Make the most of your stay with a round of golf on the championship course, a relaxing visit at the Acacia spa or a family safari in a nature reserve. 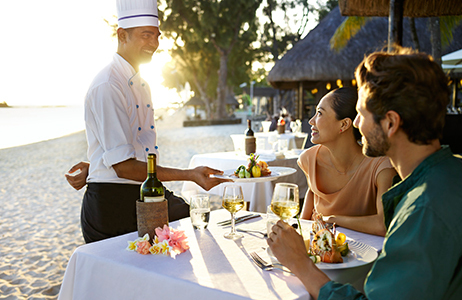 Guests looking for a luxury dining restaurant in Mauritius can savour fine international cuisine and local specialities in any of the 6 restaurants & bars for an exceptional culinary journey. 50 rooms boast a private furnished balcony offering sweeping views over the sea or onto a tropical garden. Casela World of Adventures: One Free entrance ticket per person per day. Set amid 25-acre tropical garden in the North-West of the island, Le Victoria Hotel is ideally situated between the well-known tourist hub of Grand Baie and Port Louis, the capital city. The hotel stretches along a beach covering more than a kilometer of white sand, crystalline sea water, and is entirely sheltered from the winds all year round. For the pleasure of your mind and purse, enjoy the Beachcomber All-Inclusive Package and spend an ultimate beach holiday offered at a very competitive price. Renowned for its spacious sea-facing rooms, a laid-back atmosphere and a wide array of activities for both children and teenagers, Le Victoria Hotel will be your perfect destination to enjoy memorable times with your family and friends. The hotel features three restaurants with charming atmosphere and stylish décors. Whether you choose the famous Italian restaurant, the cool beach venue serving exquisite seafood dishes or the animated main restaurant, Le Victoria caters every palate. All three restaurants facing the beach, promote outdoor living with a tropical climate all year round and are designed to suit different profiles. For those looking for a more intimate dining setting, they will most certainly head towards La Casa restaurant and for families, Le Superbe restaurant will be the perfect choice as the restaurant has an exclusive area entirely dedicated to children. 254 rooms featuring elegant and modern interior decoration. Authentic, Charming and Luxurious are the words which describe perfectly La Pirogue Hotel. This mythical Mauritian hotel promises guests a memorable holiday with warm atmosphere, exquisite cuisine, lively bars, and excellent quality service with dedicated staff member. Covering about 14 hectares of luxuriant natural gardens with beautiful hibiscus and frangipani, La Pirogue Hotel combines harmoniously luxury, serenity and beauty altogether. With the crystalline waters of the lagoon at its feet, all rooms are located at ground level and boasted a private terrace overlooking the majestic palm grove that stretches as far as the white sands of the most beautiful beach found on the west coast of Mauritius. Discover the wide array of activities offered at the hotel. 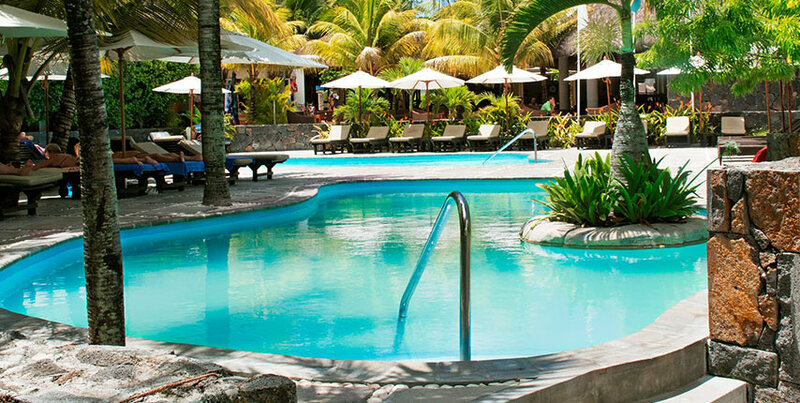 From snorkelling, PADI diving center, big-game fishing, sailing, waterskiing, or just enjoy pure relaxation at the Aura spa: La Pirogue Hotel is the resort dedicated to please every customer with great activities and services. Once you set foot in the resort, you can ditch your wallet and focus on pure relaxation and fun. Featuring an attractive all-inclusive package, holiday seekers with a limited budget will enjoy all the facilities and services of a luxurious four-star resort. Guests will have the opportunity to indulge in sumptuous breakfasts, lunches and evening meals in any of the 3 restaurants of the resort. An a la Carte menu with authentic Mauritian and International cuisine is proposed to offer clients a maximum of culinary satisfaction. 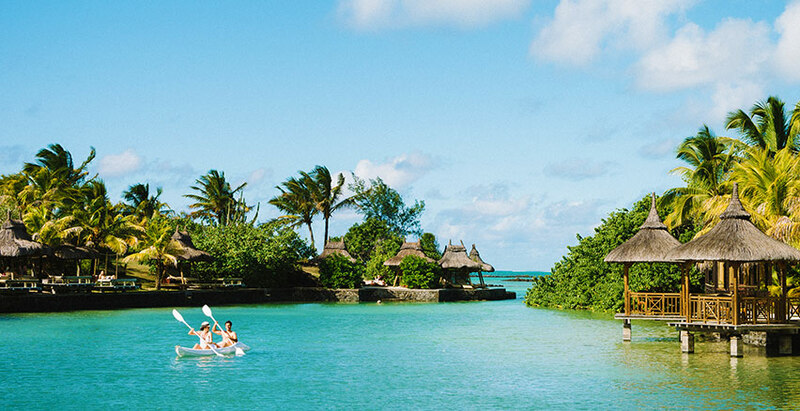 The resort furthermore offers a wide array of water and land activities and a well-known picturesque golf course on Ile aux Cerfs. 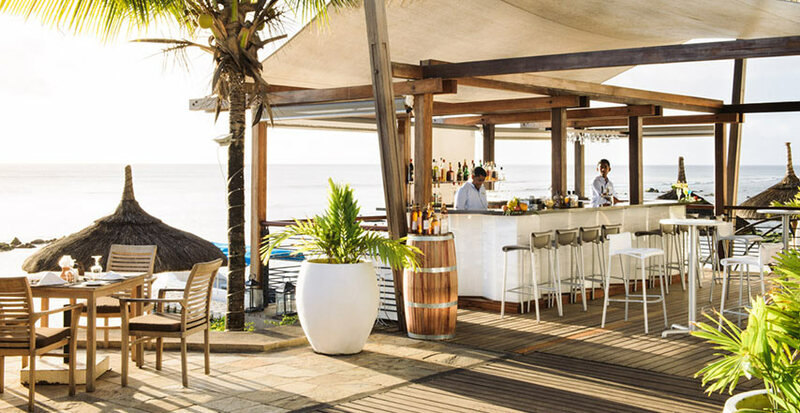 Set on the splendid South Eastern Coast of Mauritius, the Laguna Beach All Inclusive Hotel & Spa blend perfectly the modern luxury with the traditional laidback of Mauritian lifestyle. The hotel is considered as a pearl located at the scenic backdrop of the Grand-Port mountain range; a postcard beauty offering vibrant atmosphere, splendid beach and excellent quality services. It is the perfect address to renew your body and soul. Featuring 64 elegant furnished bedrooms, with a tastefully interior decors and balcony or terrace offering a unique tropical architecture, it will be the ideal getaway for couple, family or friends. Each of them is blessed with spectacular sea view and are well-equipped with satellite TV, and tea-and-coffee-making facilities. With the all-inclusive package, savor a luscious meal at the reputed restaurants as per your preference and enjoy the vast range of facilities offered at the hotel. The SeaZen’ Spa Retreat will be the ideal place to escape from the stress and strains of everyday life; to relax, unwind and rejuvenate serenely. From a revitalizing session at the gym or an entertaining time with the complimentary activities of the hotel, the Laguna Beach Hotel and Spa is where you are sure to have full excitement and fun all day long. Experience fun and exciting breakaway with your whole family at the world renowned Club Med, Pointe aux Canonniers offering you an all-inclusive package! Located on one of the most beautiful beaches in Mauritius, discover the perfect blend of family vacation adventure. Rejoice on the unspoilt beauty at Club Med Pointe aux Cannoniers, nestled at the tip of the Northern Coastline with palm trees, luxuriant tropical gardens and magnificent sandy shores. You’ll wonder why you didn’t come here sooner. The hotel accommodations offered all the comfort and relaxing atmosphere every person is looking for to unwind during holiday. 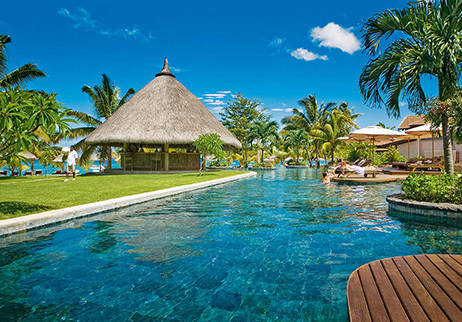 Featuring incredible views of lush gardens or over the blue lagoon, Club Med Pointe aux Cannoniers promised a revitalizing holiday to all his guests. Have a fun day like no other with the friendly and enthusiastic GO”s! A full packed list of recreational activities is offered by the hotel to suit and please both children and adults. For those seeking some relaxing moments, they can simply relax at the nearby beaches equipped with deckchairs and parasols. Among all the resorts around Mauritius, Club Med Pointe aux Canonniers offers the most incredible Kids Clubs for all ages - perfect for children to exude creativity and blossom freely through various entertaining activities! The resort caters for children of different age groups ranging from 4 months to 17 years with: Baby Club Med, Petit Club Med, and Junior Club Med offering fun and creative activities. A baby corner is also available and it provides savoury baby foods. Discover Riu Le Morne, a freshly renovated all-inclusive Adults Only Resort located on the sun-drenched of the South West of Mauritius. Found nearby the Riu Creole Club, Hotel and Resort, Riu Le Morne is ideally set on the famous Le Morne peninsula and offers a heavenly setting boasting lush vegetation and facing sparkling blue lagoon. This UNESCO World Heritage site is circled by sheltered coves and is well-known for its spectacular sunsets. Its beach offers magnificent turquoise sea waters with no tides, natural protection from the surrounding winds and a reserved area for safe snorkelling. 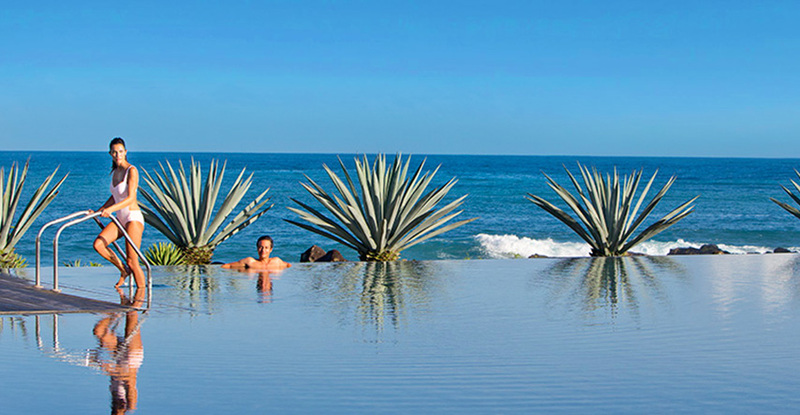 The four-star resort combines harmoniously luxury, serenity and charm for a perfect soothing retreat. At Riu Le morne, your every wish is anticipated and every whim is satisfied with top-quality service. Whether you are enjoying a meal in one of the hotel’s restaurants, having fun with the complimentary activities or simply chilling near the pool, the attentive team is committed to your well-being. The resort offers sumptuous room accommodations that blends elegantly into the lush tropical gardens dotted with glorious coconut and casuarina trees, indulge yourself in a vibrant and stylish atmosphere to unwind after a great day. 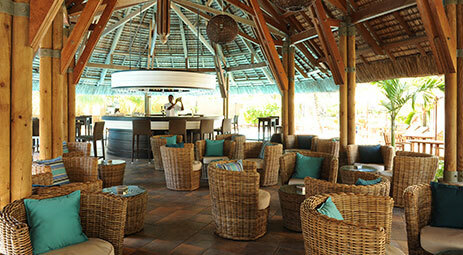 Lux* Grand Gaube, when warm Mauritian hospitality meets Far Eastern style. 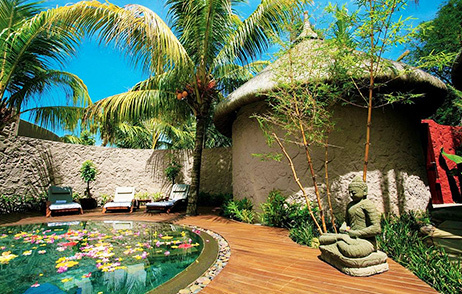 Nestled in an oasis of tranquility in the North region of Mauritius, Lux* Grand Gaube promises a zen retreat reflecting serenity and well being altogether. The hotel is tucked away in one of the island’s most beautiful locations where you can enjoy a gentle stroll in the picturesque fishing village and meet the welcoming villager of Grand Gaube. Protected from the winds and blessed with majestic filao trees, the resort overlooks the sparkling ocean and the alluring northern islets off the coast. All the rooms offer colourful décor, thoughtful design along with harmonious ambience and above all, they are all blessed with spectacular ocean views. Take a refreshing plunge in one of the five swimming pools of the hotel or choose to immerse into the rejuvenating treatments at the Lux* Me Spa: you will experience the real island life at its most glorious and joyful with Lux* Grand Gaube. 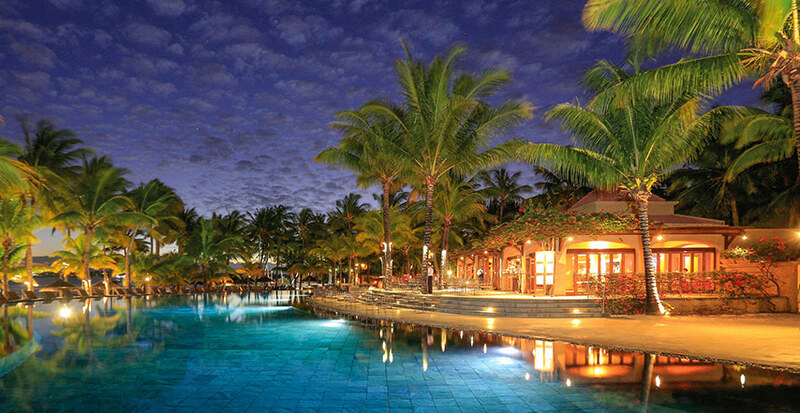 198 rooms which reflect the vibrant energy and lively ambience of Mauritius. Let you be mesmerised by the beauty of the charming Adults-Only Paradise Cove Boutique Hotel. 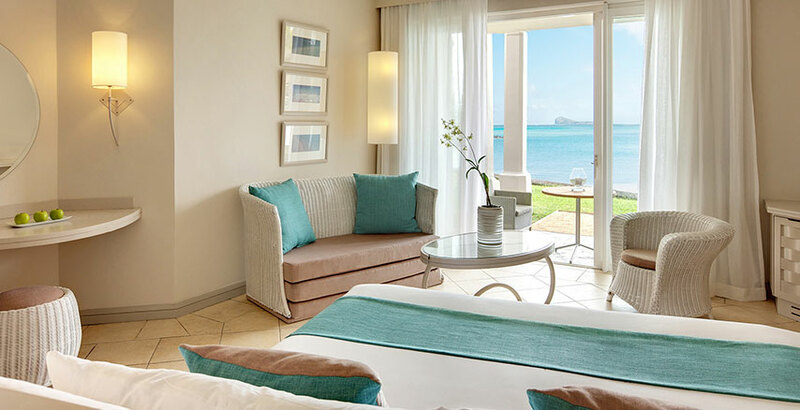 Located on the North Coast of Mauritius at Anse la Raie, indulge in the charming setting with refined decorations combined with a serene atmosphere. Spend some happy moments and enjoy a peaceful and intimate holiday with the exclusive Adult Only concept, ideal for couples, honeymooners, and friends. Perfectly designed with the Mauritian traditional architecture and modern exotic decoration, the hotel reflects a cosy stay in a completely romantic environment. With wooden furniture touch, the setting is a true witness of the influence of the original East India Company’s style. All the open spaces are nicely bathed with sunlight which will provide you a feeling of freedom, allowing each one to enjoy peacefully the beauty and character of the spot. Enjoy ultimate privacy with the numerous love nests scattered to share some precious moments together. At the far end, discover the newly renovated infinity pool facing the turquoise lagoon which offers a breathtaking view over the northern islands. The Indigo restaurant and the Pop-in bar is a real invitation to those looking for a vibrant and stylish atmosphere by the sea. All of this together with an ever-smiling and motivated staff, Paradise Cove Boutique Hotel is the place where you and your better half can share some intimate moments. 67 rooms and suites available in 4 categories: Deluxe, Deluxe Premium, Club Junior Suite and Club Senior Suite. 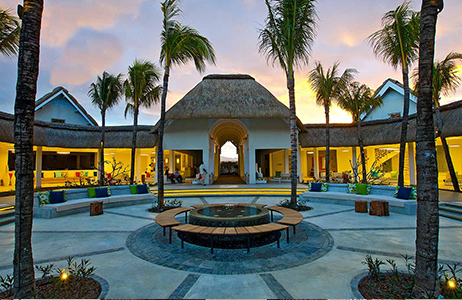 Surrender your senses to the beauty of Flic en Flac at the splendid All Inclusive Sugar Beach Golf & Spa Resort. Enjoy stunning blue sky, clear blue sea waters, verdant landscapes and soothing sea breezes and stroll in the 30 acres of exotic gardens to admire the lush greenery of this plantation-style resort. 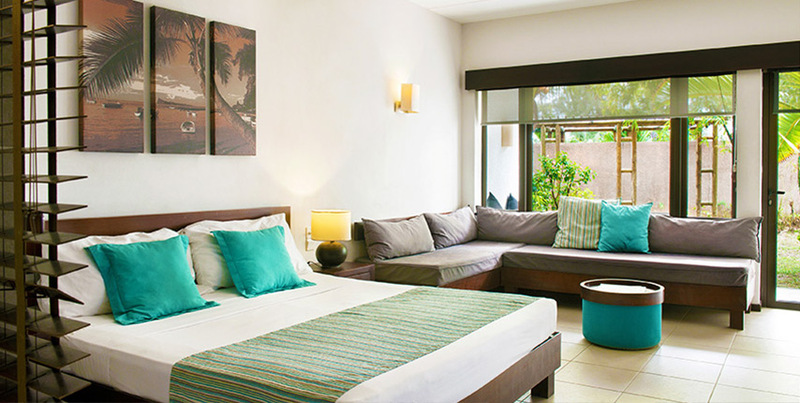 Relax serenely in guest rooms allowing each one their very own space and pace with glorious Indian Ocean views. Embrace the refinements of this luxurious resort offering mouthwatering modern Mauritian cuisine, refreshing cocktails, afternoon tea, and pampering moments at the Aura Spa. Meet at one of the hotel’s bars to toast at a blazing sunset with lively sega music, navigate on your lasers or windsurf with the dancing wind, and discover the contemporary plantation-style architecture reminiscent of a colonial mansion with exotic Creole charm. At Sugar Beach Golf & Spa Resort, you will enjoy five-star quality services where personalized services are provided by the attentive staff members. Discover peaceful ambience which are enhanced in the exclusive areas reserved to wedding and honeymoon guests. Either as a family, or couples, each guest write their very own stories. They leave with closer bonds and filled with joie de vivre. 258 rooms and suites which are sea facing and have a vintage architecture, with a modern twist. Access to 18 holes golf at l’Ile aux Cerfs and the Four Seasons Golf Club at Anahita (special package). Lying on one of the most beautiful beaches of the East Coast of the island, the Long Beach Golf & Spa Resort will surprise you with it’s classy and vibrant lifestyle resort. Being a dedicated resort for high-spirited families seeking fun and amusement, the All Inclusive package offers endless possibilities to unwind and re-energise your mind and body. The Long Beach Golf & Spa Resort comes with an exclusive and trendy approach of “Italian life” with a piazza surrounded by restaurants, bars and boutiques, to creat your ideal tropical cocoon for an elegant and relax holiday. 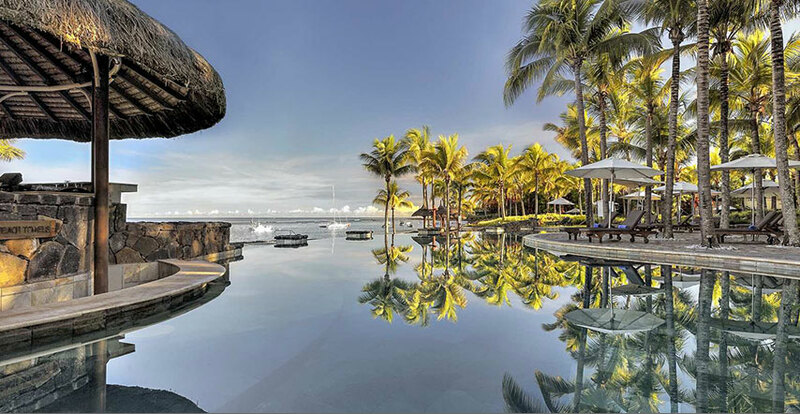 This 5-star hotel features harmoniously unique blend of modern architecture along with the magnificent natural landscape of Mauritius. Overlooking the spectacular lagoon of the well-known Belle Mare beach, the resort offers a large range of facilities and activities spread across the property. Discover all the opportunities available for creating that unique feeling of being positively filled with energy and long-lasting memories. 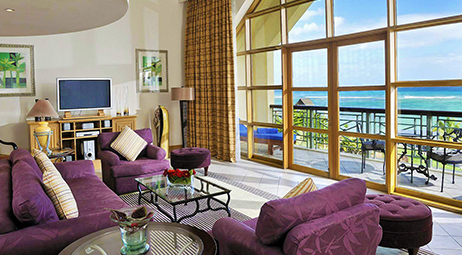 255 spacious and contemporary rooms and suites facing the sea. 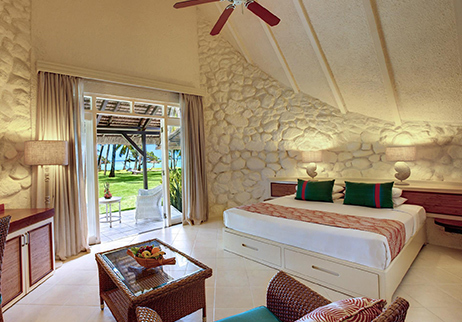 Discover Lux* Belle Mare Resort, an elegant yet cosy address to soothe your mind and soul. Nestled in a luxuriant natural vegetations near the picturesque village of Belle Mare, this enchanting resort is set along a splendid stretch of white sandy beaches along the East coast. Come and enjoy the breathtaking views of sparkling lagoon, stroll along winding tropical gardens and feel the refreshing sea-breeze on your skin. Lux* Belle Mare is all about vibrant energy and hospitality of the authentic island life. Recently beautify by the talented designer, Kelly Hoppen, the resort has gained a fresh new look with a special touch of the traditional Mauritian hospitality. Dressed in pure whites and vibrant brights colors, all the spacious thatch-roofed suites and villas faced the spectacular Indian Ocean, perfect place to unwind after a great day. Visit the renowned Lux* ME spa and various alluring restaurants, before arriving at one of the island’s biggest swimming pool with cozy spot for lounging and mingling. With Lux*’s all-inclusive beach getaways, leave your worries (and your credit card) on the doorstep. Whether you are an adrenaline junky or a pampering fiend, the resort has lined up the best activities and services to please you and to make your stay a memorable one. 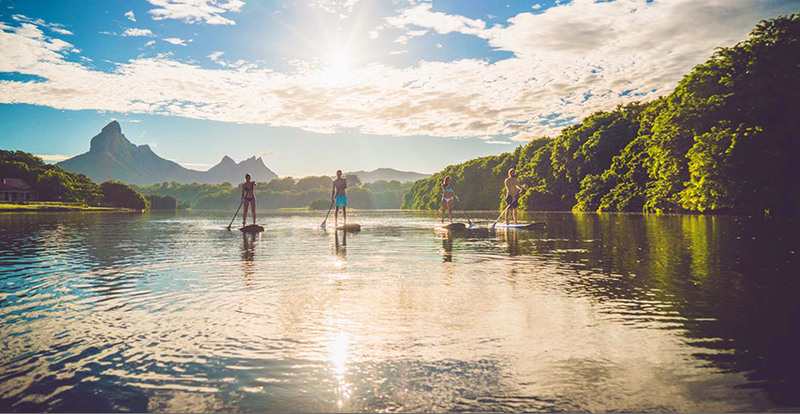 From snorkelling adventures to sumptuous island feasts and even a fully equipped fitness centre, Lux* Belle Mare makes sure each moment matters. 158 luxurious and contemporary suites. 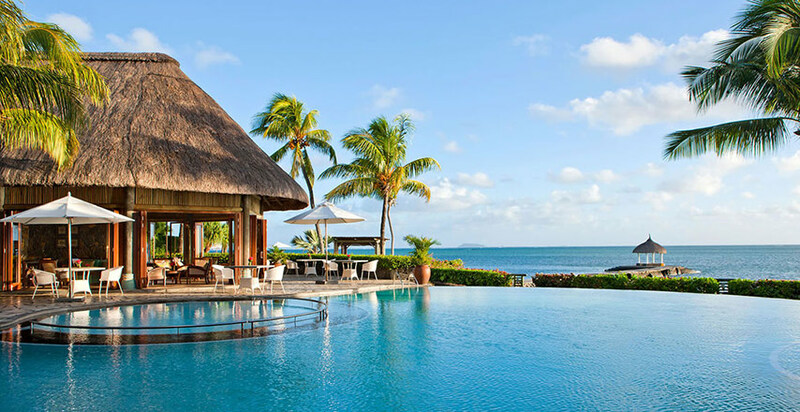 Set on the serene and unspoilt South Eastern Coast of Mauritius, The Shandrani Resort & Spa is a luxury all-inclusive five-star resort offering exclusive standards in every aspect of accommodations, food & beverages and facilities & services. Discover the vibrant vibes that the hotel has to offer and enjoy a memorable stay in a charming and peaceful resort. Located on a private peninsula hugged by three beaches and lapped by the Blue Bay Marine Park, Shandrani Resort & Spa is the first choice for action-filled holidays, ideal for families and nature lovers. The resort give to his valuable guests also the opportunity to do a short boat ride inshore which take them to the famous Ile aux Aigrettes nature reserve found nearby. With the All Inclusive “Serenity Plus” package, enjoy a stress-free holiday along with all the high class facilities and services. Make the most of this exclusive offer and immerse yourself in pure luxury, pampering atmosphere and fine dining experience. Foodwise, Shandrani features four restaurants and two bars where each one offers a different atmosphere and setting along with various cuisine address. Taste exquisite gastronomic dishes prepared by the cooks of the talented executive chef of the hotel, Olivier Belliard. Whichever venue guests choose, quality is a hallmark that is never compromised. 327 rooms and suites with terrace or balcony which offer magnificent views on the bay or the sea. 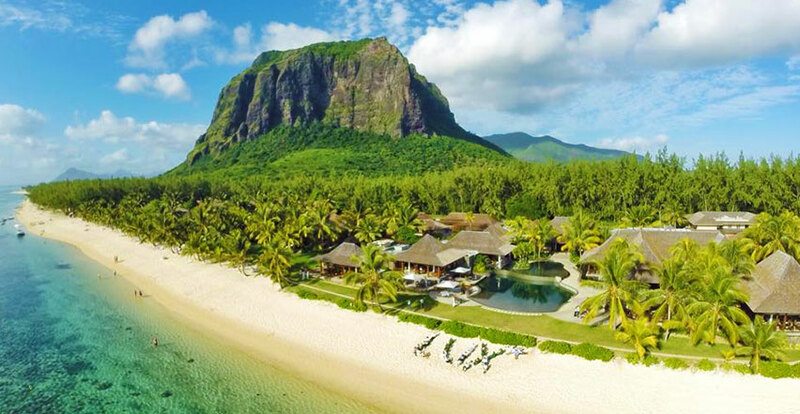 Discover a prestigious all-inclusive five-star hotel, Lux* Le Morne is nestled at the foot of the glorious Le Morne Mountain offering luxuriant tropical gardens and covering miles of golden beaches. 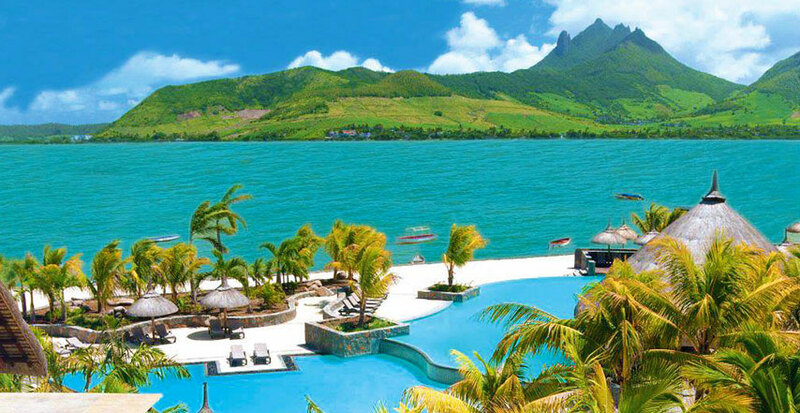 With stunning natural scenery and facing one of the most beautiful lagoon of Mauritius, the resort will delight his guests with spectacular landscape. This UNESCO World Heritage site is well-known for its breathtaking sunsets and for its shore protected by a coral reef, ideal spot for a refreshing swim. Its beach offers sparkling turquoise sea waters with no tides, natural protection from the surrounding winds and a reserved area for safe snorkelling. Make the most of this charming hotel and spend a luxurious stress-free holiday with its all-inclusive package including dining, afternoon tea time, local spirits drinks, water sports & land activities, entertainment and much more. With four great pools, a tantalizing spa and charming accommodations which are dotted around a luxuriant natural vegetations, Lux* Le Morne possessed all the laid-back elegance for a relaxing and intimate retreat. From family time to romantic moments, magical honeymoons and anniversaries, this luxury resort is waiting to indulge you. Bold flashes of purple and orange satin, wooden floors and high vaulted ceilings - Welcome to Club Med La Plantation, Albion, a five-stars all-inclusive beach resort. Set on the unspoilt sundrenched of Albion, experience a tranquil retreat along with warmth Mauritian culture during your holiday. 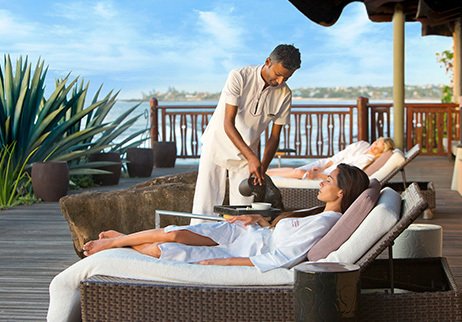 Enjoy the All Inclusive package of Club Med and let you be introduced to a world of luxury, top comfort, personal service and pure relaxation at one of the best Club Med resorts in Mauritius. With an exclusive adults-only infinity pool, sunbeds spread on the pristine shores, along with endless activities that introduce kids to the authentic local culture and nature, Club Med La Plantation d’Albion evokes a peaceful oasis with an intimate setting. Foodwise, “La Distillerie”, which is the main restaurant invites you to taste an exquisite International meal buffet. Either for lunch or for dinner, the buffet will always provides you with unlimited food to satisfy your appetite. Relish on the large choice of Mauritian, Italian, Chinese or Indian cuisine featured by the restaurants of the hotel. The head chef and his team offer flavoursome food for a memorable culinary experience. Many say that the buffet of Club Med is the largest and the best one on the island, but you could only know for sure from first-hand experience. Children’s pool in the Mini Club Med area.